Perry Block - Nouveau Old, Formerly Cute: Brain Fart! 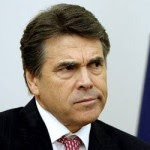 In a week of truly terrible news, Governor Rick Perry's brain fart at the Republican Presidential hopefuls' debate last Wednesday night served as a sort of comic relief for the nation. So comic in fact that Governor Perry went and did a Letterman Top Ten List on Thursday night in an attempt at damage control for stammering, stumbling, and appearing like a total idiot in front of the national television audience when called upon to state what he supposedly believes in with all his heart and soul. Brain freeze? Yes, you or I (especially you!) could easily forget our own names if called upon to debate governmental policy in front of millions. But we don't want to be President of the United States! You do? Shut up, you're ruining this bit! What happens when President Perry has a brain fart when his finger is on the button and he forgets what country he's supposed to destroy? Hopefully he'll have had an earlier brain fart and the only button he'll have his finger on will be on his belly! Friend, Romans, and Countrymen, lend me your .... umm ..... uhhh .... lawnmower! .... no, that's not it .... buck fifty for a cup of coffee .... no, that's not right .... seersucker sports coat, I've got a hot date on Friday! ...... nah, not it .... ooops! I know not what course others may take; but as for me, give me liberty or give me. ... umm .... uhhhh .... a set of Samsonite luggage! .... no, that's not it .... a new car! Yes, Patrick, you'll be the talk of the town behind the wheel of .... no, that's not right .... sorry, Patrick, but we have some fine parting gifts ..... nah, not it .... ooops! Fourscore and seven years ago our fathers brought forth on this continent a new nation, conceived in liberty, and dedicated to the proposition that .... umm .... uhhhh .... girls just wanna have fun, they just wanna, they just wanna! .... no, that's not it .... I'm lovin it! .... no, that's not right .... why don't we do it in the road? .... nah, not it .... ooops! Brain farts, so you see, can be kind of risky if you aspire to greatness. Politicians should best stick to the other type of fart. Frankly, with what's coming out of Washington, we're all used to the smell. To be fair to Perry, he can't be the only one to have a brain fart of this magnitude. The media used to start with pen and paper. Video is not a politician's friend. Yes, Winonah, anyone can have a brain fart. But it is not exactly a strong resume point when you are seeking the most stressful, pressure-filled job in the world. Want your president blanking out in front of the world when he's facing down Ahmadinejad over the prospect of nuclear annihilation? Plus be fair to THIS Perry! Humor is always about the matter of hyperbole. I don't really think Rick Perry is about to sing "Girls Just Wanna Have Fun" at the next Republican hopefuls' debate. Although think of the material that would provide me! Yeah, that stink! All the way from sea to shining sea, riding on waves of hot air going all four directions from Washington. It's true that all of us have brain farts, memory lapses, tongue-tied moments, and those pesky little naps when we're talking to Popes. But, if your gonna be the Prez, at least take your BrainStrong vitamins. I hear they sell them at Walmart. Your stuff as always is both funny and thoughtful. I wish I had more time to peruse your blog more frequently. By the way I liked your take on the Wizard of Oz. I read it when you 1st posted it. At some level these faux pas show a person's reality. They are embarrassing, but everyone of us has to learn to remove foot from mouth and keep going. I like your humorous touch to the topic in place of the overblown media "Oy vay" in shock -- as if they NEVER slip up. I think we can all lighten up a little and your writing is helping that movement. Thanks and keep going. At my age, I have memory lapses every day, forgetting common words, people's names, and once even the atomic weight of cadmium when dissolved in a uranium-based solution with neutrinos propelled via atom smasher from Switzerland. But I don't aspire to be President of the United States! If you liked my remake of the Wizard of Oz last year, hopefully you will also enjoy my upcoming remake of everyone's favorite Christmas time classic "It's a Wonderful Life." Entitled "Potter Strikes Back," it should be released in early December. If you like my work, there's another author I can recommend to you named kd McCrite. I think you'll very much enjoy her work as well. In fact, if you like, I can even introduce you! I appreciate your comment about my writing hopefully helping all of us to lighten up a bit.